The sagas of noncitizens who managed to enlist in the U.S. military and serve in uniform but nonetheless ended up deported to their countries of birth because they were charged with crimes. 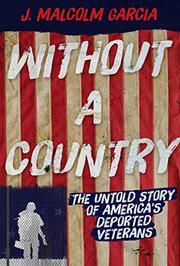 Studs Terkel Prize winner Garcia (What Wars Leave Behind: The Faceless and the Forgotten, 2014) had logically assumed that all members of the military qualified as U.S. citizens and therefore could never be deported to places such as Mexico or the Dominican Republic. But when the author began investigating a story about homeless veterans scattered throughout the country, he learned from a social worker about discharged veterans being deported by the American government. Garcia began his research in Tijuana, Mexico, following Hector Barajas-Varela, an Army veteran who created a gathering place nicknamed the Bunker about a decade ago after U.S. authorities deported him to Mexico due to crimes committed on American soil. Throughout the book, Garcia expresses outrage about the deportations of veterans. The outrage is leavened, however, by his openly stated ambivalence about the crimes committed by the deported veterans, which often caused pain to innocent parties. The author does emphasize that those veterans who served prison time in the U.S. should not be doubly punished via deportation. Garcia makes himself a character in the book, narrating first-person accounts of his travels to locate the veterans in Mexico and other locales outside the U.S. Unfortunately, the author relates the details of the case studies in prose that is often rambling and filled with irrelevant details. In addition, the structure of the book is so loose that the narrative throughline sometimes gets lost. Despite the mediocre presentation, Garcia documents an underreported phenomenon that is likely to upset readers who believe honorable service in the U.S. military should be rewarded with citizenship.